1/76 Dan Krovich The funniest movie in years - if the Oscars didn't have an anti-comedy bias, this would contend in several categories. 3/200 Max Braden This comedy got funnier and funnier, with some great dramatic moments. Arkin is excellent. 4/65 Kim Hollis A magnificent comedy about family and following dreams. Steve Carell continues to shine. 8/68 Michael Bentley Just like National Lampoon's Vacation, but funnier, sweeter, and smarter. 28/159 David Mumpower Subversive tale about a dysfunctional family's cross country trip is erratic but oftentimes hilarious. 29/52 Les Winan Not deep enough to sustain the caricatures on screen, the movie is helped immensely by Rick James' Superfreak and the always brilliant Steve Carell. 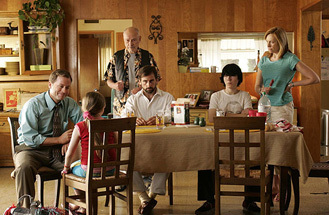 One of the most popular entries at the 2006 Sundance Film Festival, Little Miss Sunshine is a unique "family" comedy to say the least. It's developed quite a buzz in the months following its success in Utah, but is it too quirky to strike a chord with the mainstream? The film follows a dysfunctional family named the Hoovers, who are seeking to fulfill the deepest desire of seven-year-old Olive. She's a seemingly ordinary child on the outside, but she harbors some enormous dreams. She hopes to become the reigning champion at the Little Miss Sunshine Beauty Pageant, and to help her attain that goal, her family will travel from Albuquerque to Redondo Beach, California in a broken-down VW Bus. On the way, they'll contend with heartbreak and shattered dreams, and once they arrive at their destination, things take a turn for the surreal. And naturally, since they're a family, they learn more about each other and have a lot of laughter and tears. See the latest developments for this project on the Little Miss Sunshine Movie News page.